Darryl Warren had what many consider a dream job: he sold BMWs. Warren entered the world of luxury cars and wealthy clients at age 50. It seemed a step up from his many years in sales at pharmaceutical and food service companies. In his first year, Warren was a top seller at a dealership outside Charlotte, North Carolina. He brought home about $70,000. In his second year, Warren says he sold more cars but was paid $10,000 less. The BMW sales floor was hypercompetitive with a "Hunger Games" feel. A typical day started at 9am and ended at 9pm, or whenever the last customer left. Salesmen regularly worked six days a week, sometimes seven at the end of the month. 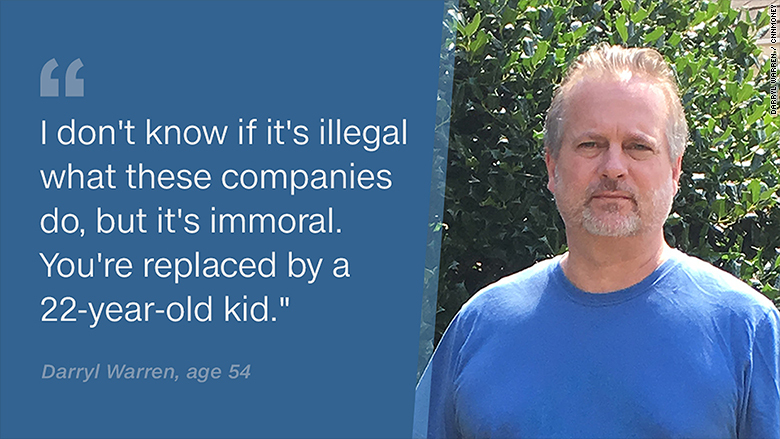 "I don't know if it's illegal the way these companies do it, but it's immoral," Warren told CNNMoney. "They literally work people to death." His body broke down. It started with back pain. Then came the panic attacks, the blood pressure medication and anti-depressants. Most days, life proceeded like this: work, come home late, drink a "fat glass of liquor," make small chat with fiancee, then pass out. For the first time in his life, he had suicidal thoughts. Warren quit in May at the urging of his fiancee. "You're replaced by a 22-year-old kid who's drawn by the promise of a cheap BMW and lots of money," says Warren, who's now 54 and living off savings while working part-time at a music store. 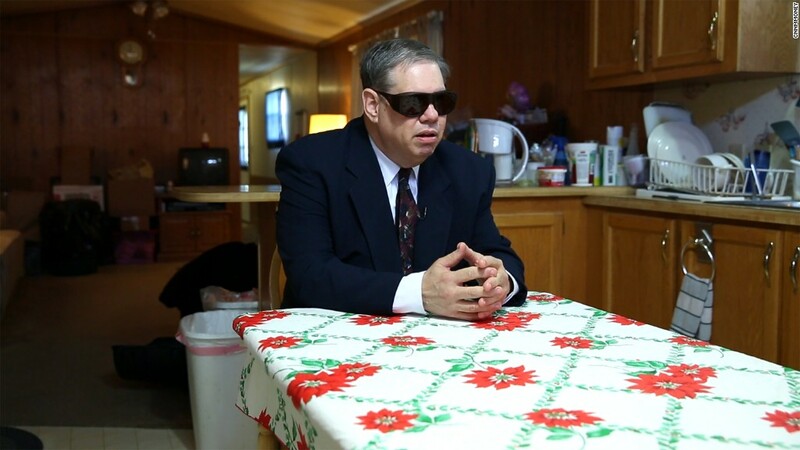 Warren isn't alone in finding himself in an unexpected and depressing place during his midlife years, where he's too young to retire, but can't find a job that matches the one he lost. There's been an alarming spike in suicides and drug and alcohol abuse among 45 to 54 year-old Americans, especially white Americans. No other rich country has seen anything like this. Nobel prize winning economist Angus Deaton was one of the first to spotlight how white "midlife mortality" in the U.S. jumped from about 381 deaths per 100,000 in the late 1990s to about 415 now. Everyone is trying to figure out why it's happening. The leading explanation is a lack of "good" jobs, especially for workers without a college degrees. "Many of the baby-boom generation are the first to find, in midlife, that they will not be better off than were their parents," wrote Deaton and fellow economist Anne Case. Americans with only a high school degree -- or less -- have seen the biggest surge in suicides. "I never ever in a million years thought I would be 54 and unemployable," says Warren. Since he has a part-time job, he is considered underemployed (not unemployed) by the U.S. government. At the music store, he earns only $10 an hour, with no benefits. It's a job for now, but not liveable. Workers over 50 -- or even 45 -- are being dubbed the "new unemployables." Unemployment soared during the Great Recession for all ages, but older workers have had the hardest time getting rehired. Share your story with CNN: How is your job and financial situation? Olga Aguilar of Florida is worried she is one of the "unemployables." The 56-year-old from Miami was laid off two years ago. Since then, she applies and applies for jobs but hasn't landed anything. "I want to be useful. I wanted to do something," Aguilar told CNNMoney. "I want to feel like I have contributed something for myself, for my family. It's just a matter of pride." Despite having a college degree in accounting and many years of experience, Aguilar can't even get interviews anymore. She worked for nearly a decade at her last job for Arise Virtual Solutions, a call center firm. Her dream is to work with animals, but she says she will "try anything" at this point. Aguilar's husband served for many years in the U.S. Air Force and fortunately has a good private sector job now. They are a proud military family. She is upbeat, but this is not the life she expected to be leading in her 50s, either. U.S. Labor Secretary Tom Perez told CNNMoney this is a real problem for America. "The over 50s, they've got talent, but they've been told hundreds of times their services are not needed," says Perez, who is on the list of possible vice presidential picks for Hillary Clinton. When older workers get laid off -- or quit -- it takes them a lot longer to get rehired than their younger peers. 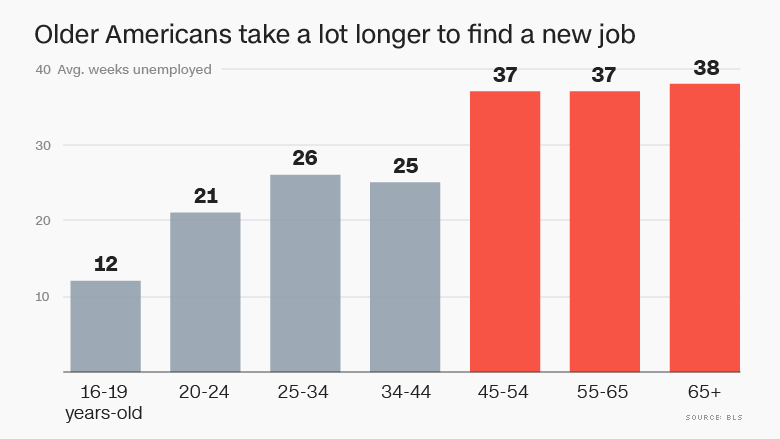 Workers over 45 have to search, on average, over 9 months to get a new job versus about 6 months for workers ages 35 to 44, according to the Labor Department. Some older workers simply give up looking for work when it takes too long. It's one of reasons America has the lowest level of adults working or searching for a job since the 1970s. The struggle to find good-paying jobs has become a key issue in the election. For younger workers, the solution is usually more education and retraining, but it's not as obvious what to do to help older workers. Perez says the best tool to aid older workers who have been out of work for more than six months is the Worker Opportunity Tax Credit. Employers get tax credits ranging from about $1,000 to $10,000 if they hire these workers for a trial run. It's akin to a glorified internship program. Often, the older worker gets a full-time job offer after the trial period is over. While Perez is glad that Congress extended the program at the end of 2015, the problem remains that not enough companies are using it. Many businesses have been flooded with job applications during the recovery. They can be choosey. There's reason to be hopeful: American companies have been on a hiring boom in recent years. The number of Americans searching over six months for a job has fallen. Today, there are under 2 million people who are long-term unemployed, compared to a record high of 6.8 million people in 2010. Of course, to be counted as long-term unemployed, a person still has to be looking for work, so a lot of people might not be counted today. All the talk of America being at or near "full employment" doesn't make much sense to Aguilar. She's one of the 750,000 workers over 45 who are still officially counted as long-term unemployed. "The only conclusion I can come up with for why I can't find work is my age. I don't want to think that, but there are loopholes in everything," says Aguilar.